After showcasing cows from Wisconsin yesterday, it’s Texas’ turn! From this photo I took as I was driving on the freeway (oh, the terrible things I would do to document this blog…), you’d think I live in Texas. But no, I live only 20 miles from downtown San Diego. 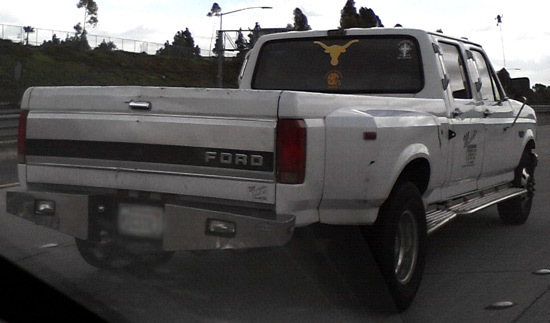 How do you like this Texas Longhorns cow decal on the back window? I remember being at a tradeshow in Houston, TX, on September 11, 2001. Because all of the air flights were cancelled for several days, I had to drive from Houston back to San Diego, and that’s the last time I saw many Texas Longhorns logos on trucks. I believe this is the first time I’ve seen one in my neighborhood, but I have a feeling it won’t be the last. 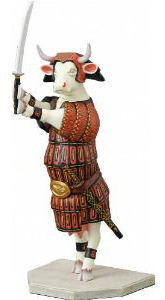 After all, it’s the year of the cow on this blog! Previous Post What do the The John Stewart Show and The Colbert Report have in common? 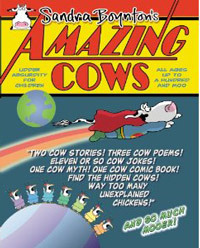 Cows, of course!